BIRMINGHAM, Mich. — The concept of “improvisational painting” might evoke the idea of loose compositions with abstract shapes — Kandinsky-like squiggles and half-formed images, or a visual jazz of color and texture. 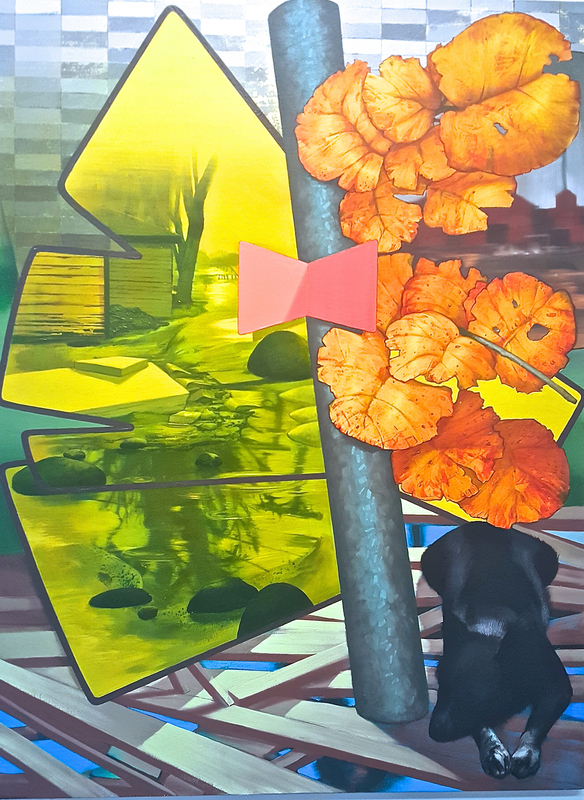 However, the paintings in James Stephens: Improvisations, the inaugural show for the new gallery ArtNxT, which opened in the Birmingham rail district in late October, are anything but loose; they are densely packed with detailed imagery and graphic motifs. 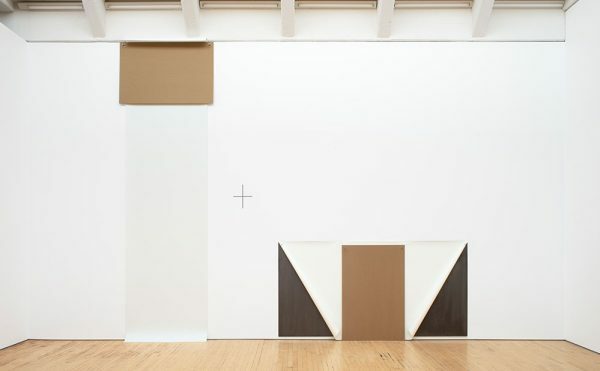 According to the artist, these paintings are improvisational in the sense that they are built through a spontaneous series of associations, triggered by shapes suggested in the initial application of patches of colors to create the base of the composition. The end products, however, are fully realized forms, complete with sharp details; like a dream state, objects and memories here create narrative with no logical connective tissue between them. Stephens characterizes this as “a reflection of the way our thoughts are randomly changing,” with one idea inevitably triggering another, and a single image including elements of past, present, and future. This inclusive perspective amounts to a broadly expanded definition of “still life” painting — what Stephens calls “still life in landscapes” — one which incorporates memories as static objects, and juxtaposes them alongside figurative and symbolic objects, often in the context of “rearview mirrors” that indicate a gaze projecting backward. 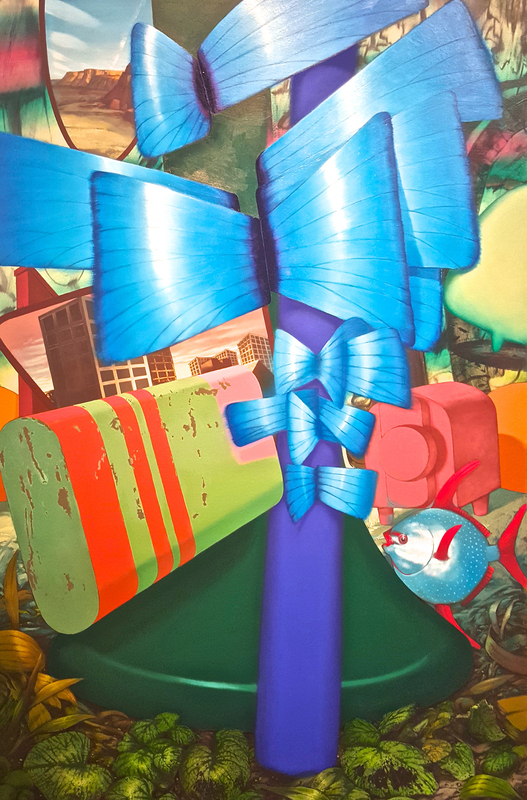 Stephens also boosts color into the realm of the hyper-real and plays with scale, exaggerating, for example, Redi-Whip caps into giant swirling mounds in the landscape of “Staging Area.” The resulting effect is part collage and part Surrealist landscape, underscored by visual punning or a kind of inside joke of which the viewer is not entirely a part. Each object or motif in the paintings carries with it a specific set of associations for Stephens — there is a Modernist house or many-windowed structure of some kind that crops up frequently, central to a triptych entitled “Lendon’s Basement (1, 2, and 3)” — but the way they string together is so personal and free-associative that the works paradoxically offer a lot of freedom for viewers to create their own interpretations. Searching these paintings is a bit like what one might experience while, say, digging through a box of mementos packed in haste and left untouched for a decade. Except the viewer not only sees the object, but also the memories that give it context, forming secondary and tertiary layers of meaning. This blending of the personal and the universal is well exemplified in the recurring motif of “wings,” as Stephens calls them, which emerged spontaneously out of the painting “Rearview,” and create a visual through-line in a number of the works in the show. I started painting those shapes … to cancel out areas I thought weren’t working. 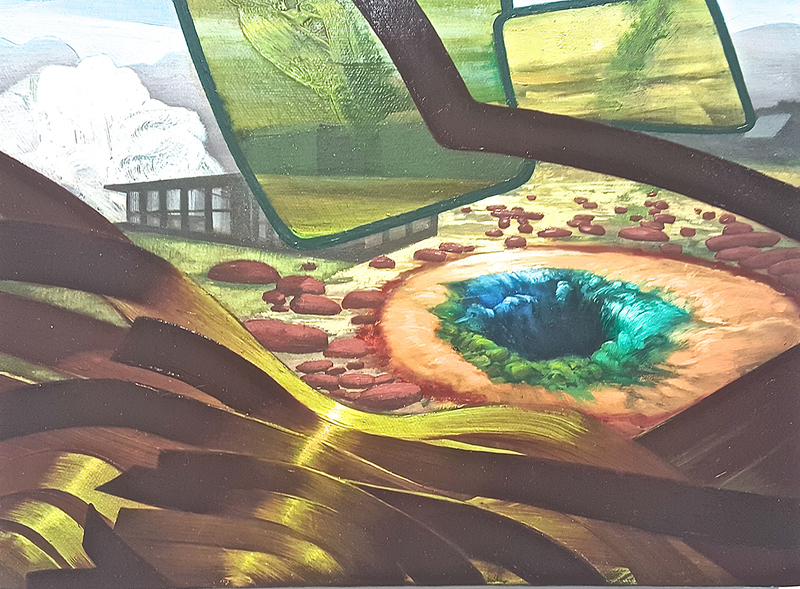 They reminded me of rearview mirrors, so I filled them with landscapes, a way of suggesting the past. While working on those landscapes, I noticed their resemblance to wings. I then immediately added wings to another painting as a way of solving a compositional dilemma. Next I painted a more literal depiction of wings in my painting ‘Whirl-a-gig.’ So, the wings weren’t added for their metaphorical connotations but I’m pleased if anyone wants to interpret them that way. Stephens’s frank acknowledgement of the elements of chance and spontaneous expression are refreshing, offering insight into the mind of a painter actively problem-solving at work, just as his imagery offers a window into his subconscious. That the simplified version of these “wings” also resemble a xango, or cosmic double-axe shape that is one of humankind’s most ancient symbols, seems not to be conscious on Stephens’s part. While drawing on the tradition of transcendental or dream painting — practiced by Surrealists, Marc Chagall, filmmaker David Lynch, and many others — Stephens seems able to pull at random from his mental image stock to create tight, colorful compositions that transmit experience, memory, and a web of creative associations to anyone who may encounter them. It’s exciting to consider that, through cultivating a sense of chance and leaving the thinking to a higher plane of consciousness, there is the potential to find a mode of expression that rings intuitively true for artist and viewer alike. 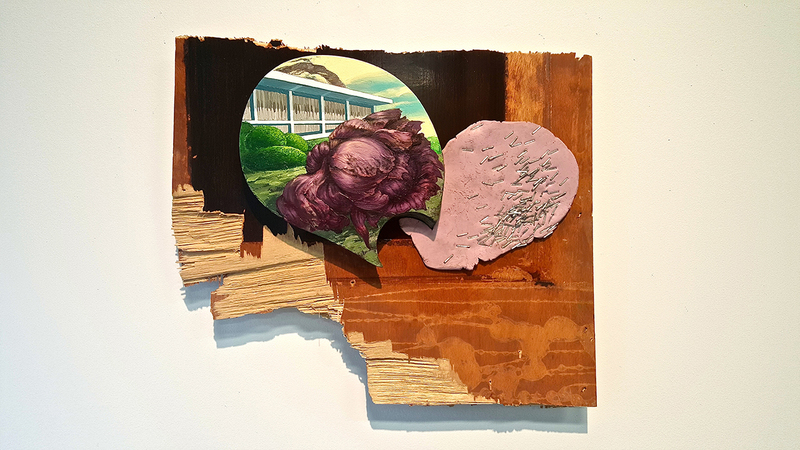 James Stephens: Improvisations continues at ArtNxT (2253 Cole St, Birmingham, Mich.) through December 6.